Student volunteers from Herbert W. Armstrong College begin work on the second phase of Eilat Mazar’s Ophel Excavation. Seventeen Herbert W. Armstrong College students and Trumpet staff members recently joined my family in Jerusalem to volunteer on an archaeological excavation at the Ophel, under the direction of Dr. Eilat Mazar. The excavation, located at the foot of the southern wall of the Temple Mount, is the site of a monumental royal complex that has been dated to the time of King Solomon. Dr. Benjamin Mazar, Eilat’s grandfather, pioneered the excavations at this location beginning in 1968. For 10 years thereafter, our predecessor Herbert W. Armstrong supplied financial support and Ambassador College student volunteers to help with Benjamin Mazar’s excavations. Following history backwards, Professor Mazar and his crew dug every summer for 10 years before they reached a wall dating to the first temple period. The ruins were so well preserved that some parts of the wall stood 5 to 6 meters high. Picking up where her grandfather left off, Eilat Mazar began a small excavation in 1986 that concentrated primarily on the first temple area of the dig. Her excavation fully revealed a large stone gateway complex, 45 by 54 feet, constructed sometime before the Babylonians sacked Jerusalem in the sixth century b.c. Also attached to the gate was a short section of the city wall of Jerusalem, built by Solomon. Announcing the news at a press conference in 1986, Mazar said the gateway complex was probably one of 12 gates mentioned in the biblical record. The Associated Press quoted Benjamin Mazar, who attended the briefing with his granddaughter: “Now we have more or less the feeling that this is really a gate of Jerusalem from the period of the kings of Judah” (April 21, 1986). 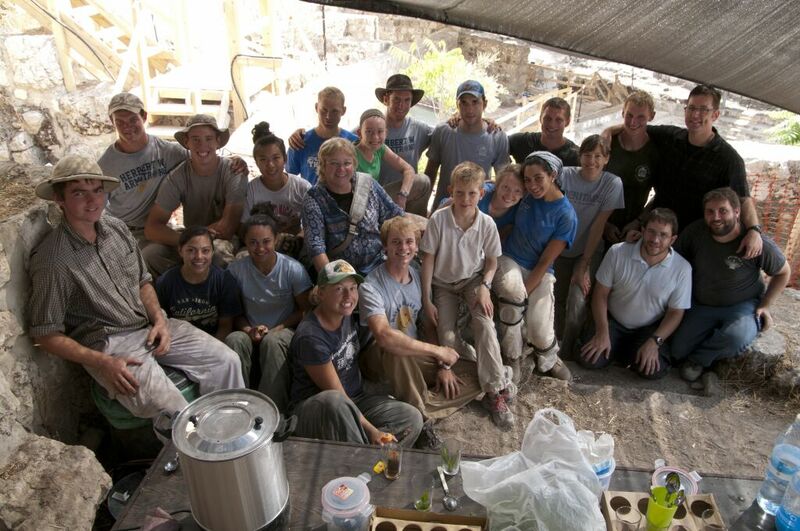 In 2009, Eilat Mazar reopened the Ophel Excavation and Armstrong College quickly agreed to send student volunteers. During that season, more fascinating details emerged about the first temple period. Inside the royal structure, Mazar discovered two floors, one layered on top of the other. Using pottery and other finds, she was able to determine the upper surface was a renovated floor that had been installed during the eighth century. The bottom floor and the walls of the structure had been constructed during the tenth century b.c. Standing next to Solomon’s wall, you can’t help but think about the massive size of the ancient Israelite kingdom that constructed these edifices. Biblical minimalists like to relegate David and Solomon to puny chieftains of an obscure tribe, but these are obviously not the buildings of wandering nomads. This wall and other archeological finds from the first temple period provide tangible evidence of an impressive and sophisticated kingdom, just as the Bible describes. Early on in David’s reign as king, somewhere around the late 11th century b.c., David captured the city of Jerusalem and established it as the nation’s capital (2 Samuel 5:1-9). After this, David “went on, and grew great, and the Lord God of hosts was with him” (verse 10). The Bible says Solomon’s reach extended all the way to the Euphrates in the northeast, to the Mediterranean Sea in the west and to the border of Egypt in the south (verse 21). Israel in the 10th century was a far-reaching, fabulously wealthy kingdom. The Bible also says that Solomon was world-famous, known throughout the inhabited world—not for his power and wealth alone, but for his God-given wisdom and understanding (verse 30). Here again, this was not some petty king or a simpleton ruling over an obscure tribe. He was a powerful, wealthy, world-famous king ruling over a large, affluent and stable kingdom. And the stones Dr. Mazar is uncovering at the Ophel and City of David excavations are beginning to confirm what the Bible recorded thousands of years ago. Like David, Solomon expanded, fortified and beautified Jerusalem. He spent 13 years constructing his own magnificent palace in Jerusalem. In addition to his palace, he built the outstanding “house of the forest of Lebanon,” a facility laden with gold, silver and other precious materials. In addition to these two gigantic structures, we read in 1 Kings 9:15 that Solomon fortified the city by strengthening the Millo, and building a wall around Jerusalem. “The city wall that has been uncovered testifies to a ruling presence,” Dr. Mazar told theTrumpet.com last year. She went on to explain that we now have scientific evidence of a fortification line that is described in the Bible. The second phase of the Ophel Excavation started this week and continues from where the last season left off. It will encompass an area that is approximately twice as large as the first phase. Given this expansion, Dr. Mazar is very happy to have much better facilities on site this time around—including spacious offices inside a Byzantine monastery and a wet sifting station adjacent to the excavation. All of these upgrades will dramatically improve the turnaround time for processing and publicizing her finds. And how significant will these findings be? “We are in the very core of the Ophel—the most important part,” Dr. Mazar said during a staff meeting on August 12. The potential, she said, is fantastic—and we should expect to find royal construction.